In stock -This product will ship today if ordered within the next 9 hours and 9 minutes. Sourced from New Zealand’s forests and Manuka trees. A bold herbaceous Manuka flavour, finished with a warm spice of ginger. Creamed to perfection. Comvita Manuka Honey is sourced from Leptospermum scoparium, a small tree that is native to New Zealand. This small shrub-like tree grows in clusters on hillsides, in coastal areas and at the edges of the New Zealand bush. During the heat of the early summer it produces a profusion of flowers a-buzz with bees busily collecting nectar to make our unique Manuka Honey - the flavour of New Zealand. Special techniques have been used to ensure that Comvita Manuka Honey reaches you in optimum condition, just as nature intended. 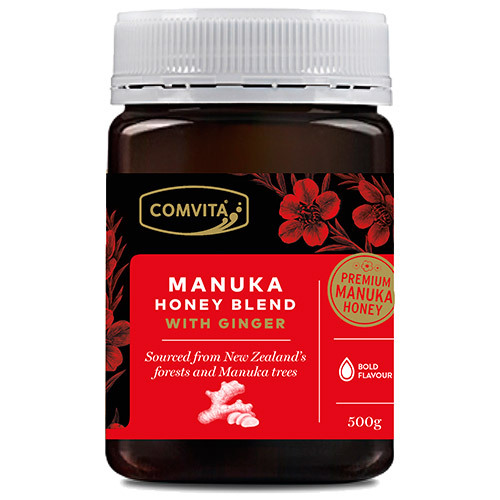 Comvita Manuka Honey, with its distinctively rich flavour and aroma, can be eaten by the spoonful, used as a spread or added to hot beverages. Manuka Honey is collected by the honey bee from native Manuka, a unique plant source recognised worldwide for its health supporting properties. These honeys are packed in Comvita`s state-of-the-art GMP (Good Manufacturing Practice) factory, into brown-tinted, unbreakable containers designed to protect the honey`s natural components. Manuka and Native Forest Honeys (99%), Ginger paste. Can be consumed straight from the jar, used as a spread or a sweetener. An ideal sugar-replacement on cereal. For preferred honey consistency, warm to soften or refrigerate to firm. 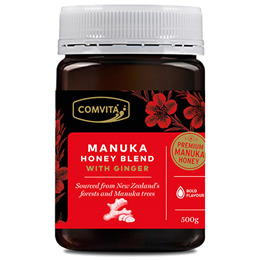 Below are reviews of Comvita Manuka Honey Blend with Ginger - 500g by bodykind customers. If you have tried this product we'd love to hear what you think so please leave a review.